The initiative taken by the British Institute of International and Comparative Law to carry out a thorough study of the rules of evidence in international courts and tribunals will place international lawyers deeply in their debt. There can be hardly any field of international legal practice presenting no possibility of presentation of a claim, at some stage nd in some circumstances, to an international court or tribunal, so that consideration of procedural issues, and in particular what facts must be proved, and how they are to be proved, may come to have almost as great an importance for the practitioner as consideration of the state of the substantive law. The proliferation of such tribunals in recent years, each with its own nature, its own constituent instrument, and its growing body of practice, also necessitates the focusing of attention on the underlying principles. The study will be an excellent starting-point, in view of the thoroughness with which the relevant material has been assembled, and set against an analytical assessment in relation to those principles. Recent contentious issues about the use of evidence in cases before the International Court of Justice have highlighted the importance of fact-finding and the use of evidence before the ICJ. This major study by the British Institute of International and Comparative Law has examined all aspects of the Court's handling and treatment of evidence in detail, in both contentious and advisory proceedings, from the recently-refined procedure for submitting late evidence, to the hearing of live witness testimony in the Peace Palace. 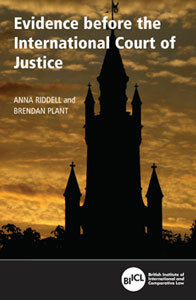 This book examines the history and development of the treatment of evidence since the early days of the Permanent Court of International Justice right up to the recent Nicaragua v Honduras Judgment, critically analysing the Statute and Rules of the ICJ, dicta from judgments and separate and dissenting opinions, the newly developed Practice Directions and academic writings on the subject. It aims not only to provide an academic discussion of the subject, but also to act as a guide to practitioners appearing before the International Court of Justice. Parts of the text were cited with approval in the ICJ by Judges Al-Khasawneh and Simma in their Dissenting Opinion in the Case Concerning Pulp Mills on the River Uruguay (Argentina v Uruguay) (20 April 2010). "Evidence before the International Court of Justice"